This article is part of our Information about information project, run in collaboration with FQXi. Click here to find out about other ways of measuring information. It's not very often that a single paper opens up a whole new science. 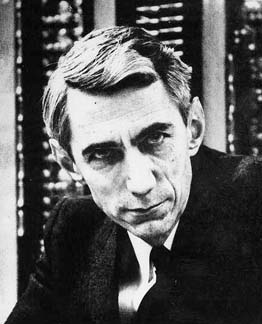 But that's what happened in 1948 when Claude Shannon published his Mathematical theory of communication. Its title may seem strange at first — human communication is everything but mathematical. But Shannon wasn't thinking about people talking to each other. Instead, he was interested in the various ways of transmitting information long-distance, including telegraphy, telephones, radio and TV. It's that kind of communication his theory was built around. Shannon wasn't the first to think about information. Harry Nyquist and Ralph Hartley had already made inroads into the area in the 1920s (see this article), but their ideas needed refining. That's what Shannon set out to do, and his contribution was so great, he has become known as the father of information theory. Shannon wanted to measure the amount of information you could transmit via various media. There are many ways of sending messages: you could produce smoke signals, use Morse code, the telephone, or (in today's world) send an email. To treat them all on equal terms, Shannon decided to forget about exactly how each of these methods transmits a message and simply thought of them as ways of producing strings of symbols. How do you measure the information contained in such a string? It's a tricky question. If your string of symbols constitutes a passage of English text, then you could just count the number of words it contains. But this is silly: it would give the sentence "The Sun will rise tomorrow" the same information value as he sentence "The world will end tomorrow" when the second is clearly much more significant than the first. Whether or not we find a message informative depends on whether it's news to us and what this news means to us. Shannon stayed clear of the slippery concept of meaning, declaring it "irrelevant to the engineering problem", but he did take on board the idea that information is related to what's new: it's related to surprise. Thought of in emotional terms surprise is hard to measure, but you can get to grips with it by imagining yourself watching words come out of a ticker tape, like they used to have in news agencies. Some words, like "the" or "a" are pretty unsurprising; in fact they are redundant since you could probably understand the message without them. The real essence of the message lies in words that aren't as common, such as "alien" or "invasion". This suggests a measure of surprise for each word: the frequency with which it appears in the English language. For example, the most frequent word in the 100 million word British National Corpus is the word "the", appearing, on average, 61,847 times in a million words. The word "invasion" appears, on average, only 19 times per million words, while "alien" is not even listed, presumably because it is so rare. 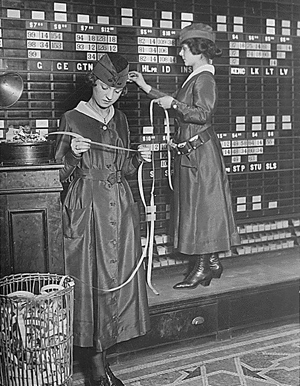 Unsurprised women watching the ticker tape in 1918. You could simply measure the amount of surprise you feel when a word occurs by the number of times it occurs per million words in some large volume of English text. But this would be missing a trick. The word "invasion" is pretty surprising when it follows the word "alien", but less surprising when it follows the word "military". Perhaps surprise should be measured, not only in terms of the overall frequency of a word, but also in terms of the word that came before it (you can do this by looking at the frequency of pairs of words in large body of text). To capture even more of the structure within the English language, you could base your surprise measure on the frequency of triples, quadruples, quintuples, and so on. Both sentences are utterly meaningless, but the second looks just that little bit more like an English sentence than the first: there are whole strings of words that actually make sense. But Shannon's games with random words had another purpose too. If you picked a more sophisticated probability distribution for your words, one that picks up on more structure within the English language, you could presumably approximate that language much more closely. Conversely, you could think of any device that produces strings of words, like the ticker machine, as a stochastic process. Forget about the person who is sending the message and the meaning they want to convey and simply imagine the machine picking words at random, based on a probability distribution that closely reflects the structure of the English language. To formalise things even further, forget about words and think of the machine picking individual symbols according to a certain probability distribution. This way, we can measure surprise not only for languages spoken by people, but also for strings of 0s and 1s produced by a computer, or for smoke signals sent in the forest. Most people would be surprised by an alien invasion. According to this definition the surprise associated to seeing a longer string is simply the sum of the individual surprises. This sorts out the amount of surprise, which we've related to the amount of information, of a string of symbols produced by our machine. For reasons that will become clear later, we can also calculate the expected amount of surprise the machine produces per symbol. This is akin to an average, but takes into account that symbols with higher probabilities occur more often, and should therefore contribute more to the average than those with low probabilities (see here to find out more about expected values). The concept of entropy was first developed in the context of thermodynamics, the study of heat. If you know some physics then this expression might look familiar. It looks exactly the same as a quantity called entropy which physicists had defined around seventy years earlier to understand the behaviour of liquids and gases (find out more in this article). This parallel wasn't lost on Shannon. He called the measure of average information defined above the entropy of the machine. It depends only on the probability distribution of the possible symbols, the exact workings of the mechanism producing it don't matter. Entropy is a truly universal measure of information. It’s lower than the entropy of the fair coin and this makes sense: knowing that the coin is crooked, we can guess the outcome correctly around 90% of time by tipping on H. Therefore, on average, our surprise at seeing the actual outcome isn’t that great — it’s definitely less than for a fair coin. Thinking of surprise as measuring the information, this tells us that the average amount of information inherent in the machine printing one symbol is less than the corresponding number for the fair coin. But why on Earth would you want to calculate the average amount of surprise (or information) per symbol? It turns out that Shannon's entropy also has a very concrete interpretation that is very relevant to the modern world: it measures the minimum number of bits — that's 0s and 1s — needed to encode a message. To find out more, see the next article. Marianne Freiberger is co-editor of Plus. She would like to thank Scott Aaronson, a computer scientist at the Massachusetts Institute of Technology, for a very useful conversation about information. And she recommends the book Information Theory: A Tutorial Introduction by James V. Stone as a mathematical introduction to the subject.